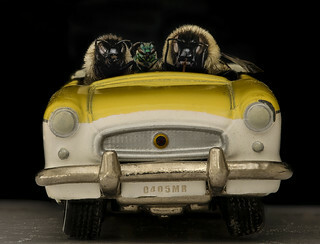 Bees Learn to Drive Very Small Cars. Scientists capitalized on recent revelations that bees are a lot smarter than previously thought. In addition to being able to count and solve simple puzzles USGS scientists at the Patuxent Native Bee Lab have taught bees to driver miniaturized automobiles. Using rewards such as flower smoothies and honey laced with addictive pollens, bees were gradually induced to drive in order to continue receiving their rewards. The study came to an unfortunate ending when one of the lab assistants was overwhelmed by angry bees who felt that the researchers were holding back on their pollen loads. Future plans are in the work to use less coercive methods and talks are in progress with several bee advocacy groups. For release on April 1, 2019. Photography by Brooke Goggins.